The Encyclopedia of Saints offers thorough and fascinating accounts of familiar and little-known holy men and women of the Catholic and Orthodox churches. Drawing from documented accounts and supplemented with additional extensive research, more than 400 entries describe their lives and religious journeys, mystical experiences, important influences and motivations, and historical and philosophical contributions. 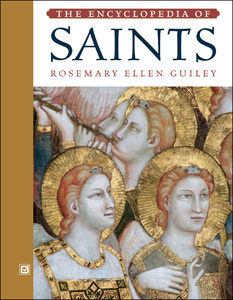 Interwoven throughout these in-depth biographical accounts are colorful and little-known facts about the saints, including St. Francis of Assisi's life prior to his conversion, St. Teresa of Avila's miraculous healing, and the dream that turned St. Augustine away from his pagan beliefs. Detailed appendixesincluding information on patron saints by topic, a calendar of feast days, beatified and canonized popes, an explanation of the canonization process, a glossary of terms, a glossary of heresies, and moreprovide a comprehensive, in-depth understanding of sainthood. Saints profiled include Blessed Andre Bessette, Anselm, Barnabas, Catherine of Sweden, Elizabeth Ann Seton, Fabian, Pope Gregory I, Hildegard of Bingen, John of the Cross, Lucy of Syracuse, Mark the Evangelist, Nicodemus, Rose of Lima, Simon Stylites, Thomas Aquinas, William of Norwich, and Zita. "...up-to-date...Individual entries are longer than those in most guides to saints...readable..."
"...there are some fine black-and-white reproductions in this book... appendixes...are quite useful." "Written for the general public, the readable entries establish social and historical context and do not shy away from identifying controversial or unsubstantiated claims...[the author] does not attempt to interpret or proselytize. Instead, she allows the facts to speak for themselves...Public libraries in need of a basic, accessible resource for the reference collection, or collections that need to update...will be well served by this volume."